The first of this year’s two royal weddings is fast approaching and excitement is building. For those of us who love jewellery, the question of Meghan’s wedding jewels is bigger than her choice of dress, flowers and veil combined. Critically, will Meghan wear a tiara? Tiaras are a common choice for royal brides, but there is strict protocol about who can wear them and when. Supposedly, only married women wear tiaras, beginning with their family tiara on their wedding day and tiaras from their spouse’s family thereafter. Interpretations of this social expectation vary, but tiara themselves always carry a special meaning. Tiaras descend from the laurel wreaths and floral headdresses of antiquity; these natural head ornaments were later immortalised in gold. The ancient Greeks and Romans wore gold diadems for self-adornment and to display their wealth, as well as gifting these precious ornaments to the gods. In Europe, by the thirteenth century, a woman of any status could wear a tiara at their wedding to symbolise their marital joy and acknowledge the benefits and security that were believed to come with marriage. Like most women today, Meghan may not have a family tiara to-hand, but her new in-laws certainly do! The Queen occasionally generously loans jewels from the Royal Collection and from her personal collection to younger members of the family. 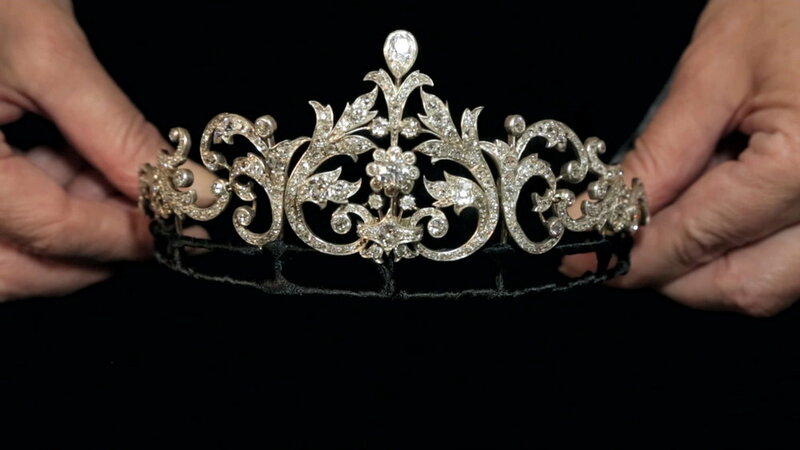 In 2011, the Queen loaned the diamond-set Cartier Halo tiara, also known as the Scroll tiara, to the Duchess of Cambridge on her wedding to Prince William. It seems highly unlikely that Meghan would wear the same tiara, but the relatively small size of the Cartier Halo tiara suggests that Meghan may also choose something small to acknowledge the Duchess of Cambridge’s position as future queen. A favourite of the Queen, Princess Diana and the Duchess of Cambridge, the Cambridge Lover’s Knot Tiara is a slightly larger, but beautiful, choice for a wedding tiara. The design incorporates large drop-pearls hung from diamond-set bows, known as lover’s knots, and was commissioned by Queen Mary based on a tiara belonging to her grandmother, Princess Augusta of Hesse, the Duchess of Cambridge. Made in 1913 for Garrard, the tiara was crafted by the talented craftspeople of E. Wolff & Co., now E. Wolfe & Co., who discuss their history of tiara manufacture with me in my online jewellery school’s Foundation Course. Between 1898 and 1911, E. Wolff & Co. made more than 1,016 tiaras, a number that demonstrates the huge demand for tiaras in the early twentieth century! Though the relatively large size of this tiara may dissuade Meghan from wearing it, the jewel carries great sentimental value for Prince Harry. Worn frequently by his mother, Meghan and Harry may decide that this tiara is another way of including the late Princess in their wedding ceremony. If Meghan chooses to wear a tiara this weekend, she will follow both ancient and royal tradition, but there are always exceptions to tradition. On her wedding, Queen Victoria wore a wreath of fresh orange blossoms that mirrored the orange blossom brooch Prince Albert gave her before their marriage. Later, Prince Albert recreated the wreath in gold, porcelain and enamel to mark their wedding anniversary. Will Meghan follow this royal decision and wear flowers in her hair instead of jewels? Alternatively, Meghan could choose to wear clips arranged in her hair instead of a complete tiara. Diamond-set stars clipped into hairstyles were popular in the nineteenth and twentieth centuries and provide an interesting and more manageable alternative to the tiara. As we become less and less accustomed to fixing tiaras into our hair, our understanding of how to secure tiaras is lessening. Today, tiaras prove problematic for hairdressers who have to battle with pins and hair products to ensure no mishaps occur whilst the bride walks up the aisle! Meghan may therefore decide to avoid the issues and weight of a tiara and opt for something smaller, but still eye-catching, instead. As we wait in suspense for the big day, we can rest assured that Meghan’s choice of jewels will have been just as important, if not more so, than the myriad of other decisions the new couple have made in the lead up to their big day. Most importantly, we’re excited to see how Meghan takes on the royal tiara expectations and reinterprets them to suit her individual style. Congratulations to the royal couple! Joanna discusses royal tiaras and engagement rings with presenter Michael Buerk on a Wedding Special of BBC’s series Royal Recipes. Airing on Tuesday 15 May at 15:45 on BBC 1 and Wednesday 16 May 07:15 on BBC 2. Joanna will also be commenting live on the wedding jewellery on BBC on Saturday 19 May.